The Sustainability Challenge is an interdisciplinary University course on Sustainable Development. The initiative is carried out by four universities and serves one purpose: to educate leaders of tomorrow through an innovative learning experience. The Sustainability Challenge is a unique, innovative and transdisciplinary university course related to sustainable development and the SDGs (Sustainable Development Goals) of the UN. It has taken place since 2010 on a yearly basis and is held by Vienna’s four main universities: Vienna University of Economics and Business (WU), University of Vienna, Vienna Technical University (TU) and the University of Natural Resources and Life Sciences (BOKU). The Sustainability Challenge is managed by RCE Vienna and works in close collaboration with external partners, such as companies, ministries and NGOs. 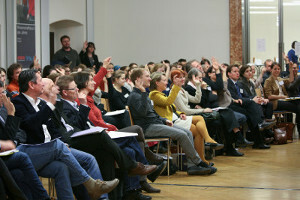 Currently, the Austrian Development Agency provides the largest part of funding. The Sustainability Challenge is dedicated to the objectives of sustainable development, embracing the topic through varying key issues such as sustainable urban development (2014 – 2017) or the SDGs (2017 – 2020). Every year, 60 – 80 master, Ph.D. and advanced bachelor students from all fields are selected through a detailed application process. The sustainability challenge offers two participation tracks: service learning and start-up. In service learning interdisciplinary student teams work together with a partner (e.g. companies, ministries, NGOs) on an SDG-related project defined by the partners. Students with their own sustainable business idea are supported in becoming sustainable entrepreneurs and found their own start-up when participating in the start-up track.